At one time or another, everyone has had situations where zooming in on a video clip adds that finishing touch. Whether it’s for effect or for greater stand-off distance, the convenience of camera zoom takes your photography to the professional level. In this blog, I’ll show you how to get Full High Definition (1080p) results at a zoom factor of 1.4x using a fixed-lens camera. This is good information for venues like sporting events and weddings, which can be recorded from the air but at a great enough distance so the drone’s presence has minimal notice. For more information on camera resolution please read my blog Setting Up Your Aerial Drone Camera. Do I Need an Expensive High-End Drone and Camera? For a modest investment of $5,000 you can purchase a DJI Inspire 2 drone, Zenmuse X5S camera, and Lumix 14-42mm zoom lens and the results will be quite professional. The Lumix lens gives you the standard camera focal length equivalent of 28-84mm. So, with 50mm as the standard for zero magnification, this camera has a zoom range of 0.6x wide angle to 1.7x telephoto. Remember these numbers. Is There a Less Expensive Alternative? There’s another solution that is far less expensive and provides excellent results. Many drones on the market can record Cinema 4K video, which has a resolution of 4096×2160 pixels. However, most users are satisfied with a Full HD resolution of 1920×1080 pixels. 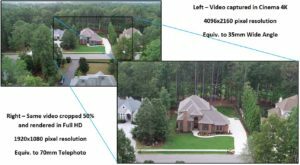 What these numbers mean is that to get a digital zoom capability, you can record video in Cinema 4K mode, which leaves plenty of resolution to render any portion of the frame in Full HD. Rendering the video is done in post-processing, where video clips are transformed into the finished video. For example, we can use our drone to record the desired scene in C4K mode. We start with the equivalent wide angle focal length of the camera’s lens, which is 35mm (0.7x). Using post-processing software, as much or as little of the C4K image can be cropped for the desired magnification. So, when your video is captured in C4K, you can select a crop “window” of up to 50% and render your new “zoomed-in” video in beautiful FHD. In other words, you get a full-definition 1920×1080 pixels! For this level of cropping, you achieve a zoom factor of 1.4x, equivalent to a 70mm telephoto lens. Compared with the $5,000 solution, which zooms 0.6x to 1.7x, this digital zoom technique gets you 0.7x to 1.4x. Two for sure . . . If you want even more zoom, just crop to get the desired magnification. There’s no limit to how much you can crop, though you will start to see the results of lower resolution. For example, you can crop at 25%, which gives you a zoom factor of 2.8x (140mm telephoto) but the resulting FHD video will display a lower resolution of 1024×540 pixels. Any method of zoom will increase the image’s sensitivity to camera movement. So a small and acceptable level of vibration at 0.7x may be objectionable at 1.4x. Unwanted vibration can be minimized in post-processing using image stabilization. For more information please read my blog Video Production and Post-Processing. At FAD-Photo, we use the DJI Phantom 4 Professional V2, which provides a highly stable platform capable of stunning high definition photographs and videos. We have mastered the art of taking C4K videos and using our post-processing software to minimize vibration and render FHD videos. We deliver the results you would expect from a professional aerial drone photography service! For more information, please refer to our Aerial Drone Photography and Video Services page. Flying in High Winds – What Could Possibly Go Wrong? In this blog, we explain why we limit our flights to wind speeds of 10 mph or less. Seem drastic? Please read on; this is good information. Drone electronics are quite sophisticated, as they use inertial navigation to stabilize the drone’s camera so it’s almost free from the effects of wind patterns. However, there’s a design limit at which the stabilization reaches the “stops” and no longer holds the camera level. When the drone is buffeted by gusty winds, the magnitude and direction of the wind can shift quite suddenly. This gives the drone’s stabilization system a workout and sometimes the requirements go beyond the linear operating range. The result is a momentary tilting of the image sent to your remote control. Even with non-gusty winds, the drone’s camera may yaw left or right as the drone’s control system compensates for the wind. OK, Crooked Photos And Videos; Is That It? Not really – something much worse can happen when the drone is buffeted by strong gusts: Such as the sudden loss of your drone! The drone’s stabilization system works very hard to keep the camera steady, but when the wind vector tries to tilt the drone, the motors will adjust speed AND DIRECTION, as necessary, to maintain level. If the wind vector is strong enough, one or more motors can momentarily be driven in reverse. If your propellers screw on, such as the Phantom 3 series, they rotate in a direction that is usually self-tightening. However, if the motor momentarily reverses in a gusty situation then the propeller can actually unscrew and spin-off. The best way to safeguard against a spin-off is to screw the propellers on very tightly. If you’re flying a DJI drone, this means using the supplied wrench. If your drone uses the new quick release propellers, they can still spin-off, but you’re at a lower risk. Take the Phantom 4, Inspire 2, and Mavic series for example. Their propellers mount with a push and 1/8 of a turn. You (we all) feel safe because there’s a relatively strong spring to hold the propeller in place. However, these drones’ control systems can still drive the motors in reverse. When thrust is reversed and the propeller pushes hard enough against the spring then it will fly-off. Having some speed on the drone reduces the forces that can drive the motors in reverse. But the pilot should be very careful about low speeds and hovering because these are the conditions that make it more likely that a gust will try to pitch the drone over. Of course, the best way to safeguard against a spin-off is to avoid flying in high winds. 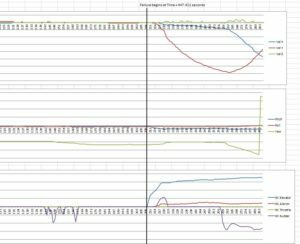 The graphic above was taken from telemetry received from an actual spin-off event. Why Can’t The Drone Fly With One Propeller Missing? A drone with six or more propellers can survive a one-propeller spin-off. But drones with four propellers are doomed. These drones have two props that rotate clockwise and two that rotate counterclockwise. They were designed this way to cancel the drone’s tendency to rotate. But if you remove one propeller, the drone will go into a spin. Without a propeller there’s no lift so that corner drops down. So in addition to spin, the drone goes into an uncontrolled roll/pitch. The drone is hopelessly out of control and falls to the earth. Inspect the propellers before every flight. If you must fly in winds greater than 10 mph, understand that gusts can easily double the wind speed. Take precautions that the propellers are screwed on tightly with a wrench. If you see the image tilting on your remote control, land your drone immediately. Better to fly another day than to take chances on a windy day. What Should I Expect To Pay For Aerial Drone Photography Services? 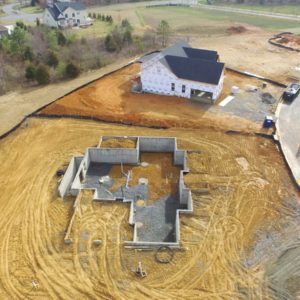 Fredericksburg Aerial Drone Photography - Serving Fredericksburg, VA; Spotsylvania, VA; and Culpeper, VA.